The Dutch National Ballet, the sole classical company in The Netherlands, is doing well on home video. The Blu-ray/DVD catalogue of the Amsterdam-based troupe is steadily growing with interesting titles, often linked to the successful practice of live broadcasts in movie theatres. Both Tchaikovsky's The Nutcracker and Prokofieff's Cinderella are of course popular favorites, yet the Dutch productions boast plenty of individual qualities to justify their purchase. While cast in a traditionally classical mold, the ballets reviewed here are not only spectacularly staged with grand sets and magnificent costumes that benefit from the high definition transfer in widescreen, they are also splendidly danced. The Nutcracker (or called here The Nutcracker and the Mouse King) in a choreography by Toer van Schayk and Wayne Eagling has been a seasonal box-office hit in Amsterdam since its creation in 1996. (By the time this show was filmed in 2011, allegedly a quarter of a million people had attended the ballet.) In this version the original story of the girl Clara and her toy Nutcracker turning into a handsome prince was cleverly relocated to bourgeois Amsterdam in the Napoleonic era, where folks are getting ready to celebrate Saint Nicholas eve (5 December). Although Christmas trees are absent, the December setting still allows the familiar wintry scenes (including skaters on the frozen canals), cozy homes and presents. The producers didn't overlook the magical side of the story, added plenty of humor, and ensured dramatic coherence by having characters and events from the 1st act reappear in the 2nd. The choreography may not always be the most inventive, the overall skill and zest of the large cast, including dozens of eager children, are irresistible, while van Schayk's opulent and accurate period designs make the production a feast for the eye. Last but not least, the leading roles are performed by two of the company's most attractive principals, Anna Tsygankova and Matthew Golding, whom by themselves would warrant the price of admission. This live performance captured at the home theatre of the Dutch National is agreeably directed by Jeff Tudor, although neither the video nor the audio quality are exactly top drawer. Nothing really dramatic to mar the viewing experience, but the high definition cameras didn't fully master the treacherous stage spotlighting, allowing too many overly lit spots on costumes and heads. There is also occasional blurriness during quick movements or camera panning. The Holland Symfonia under Ermanno Florio don't give us the most exciting performance of this marvelous score either. Available in a LPCM Stereo and a DTS-HD Master Audio 5.1 mix, the soundtrack has clarity, but Tchaikovsky's many climaxes lack real bite and drama, and there are some unconvincing orchestral balances along the way. This is apparently a second edition of this release which unfortunately replaces the bonus documentaries for a useless series of trailers from the Arthaus Musik catalogue. Yet, for a convincing alternative approach to a familiar ballet, in an eye-catching production with some great dancing, one needn't hesitate. 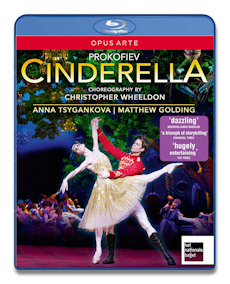 Cinderella released by Opus Arte features both Tsygankova and Golding in the lead as well and with more screen time they are even more impressive here. This version of Prokofieff's 1945 fairytale ballet is a brand new rewrite by the acclaimed British choreographer Christopher Wheeldon, brought in a co-production between the Dutch and San Francisco Ballet, which was premiered in Amsterdam in December 2012. The joined talent of the British theatre designer Julian Crouch, the American video projection designer Daniel Brodie and the puppeteer Basil Twist created a magical, colorful and often visually dizzying canvas wherein Wheeldon's choreography moves the action forward in a fluent, almost cinematographic manner. Part of the success of this Cinderella stems from a refusal to follow Prokofieff's music to the letter. Instead, Wheeldon and the American playwright Craig Lucas gave narrative shape to the fragmentary score not only by sourcing several extant versions of the fairytale – primarily from the brothers Grimm – but also by introducing elements of their own. Without sacrificing the romantic-fairytale content, Wheeldon added touches of verismo, skillfully spicing the drama with plenty of wit and making sure to have people of flesh and blood to enhance the familiar story. Prokofieff's score ends up being quite severely edited and reordered (take the beginning of Act 2 which immediately jumps to the Mazurka and is followed by sections ripped from Act 3, while passages from Act 2 already appear in Act 1 and music from Act 3 is used in the ball). Little to worry balletomanes and within its theatrical context working perfectly well, even if for the non-initiated it may sound nothing sort of sacrilege. The production translates rather well to video, again thanks to Jeff Tudor's alert direction, even if some of the real theatrical magic, like the spectacularly staged preparation of Cinderella for the ball, remains underwhelming on the screen when compared to the live experience. The video and audio quality, however, are outstanding for this release, as if the producers were able to come to terms with the theatre environment. Shot barely a year later in the very same Music Theatre in Amsterdam, color definition, contrast, sharpness all make for a very impressive and enjoyable viewing experience. Sound-wise this Cinderella is a treat as well. The music sounds a lot more convincing here by the same Holland Symfonia and maestro Florio. Available in LPCM 2.0 stereo and a DTS-HD Master Audio 5.1, the latter offers solid but well detailed audio, with Prokofieff's frequent use of low brass and bass drum most vividly reproduced. The rear channels of the surround mix are effectively used for hall ambience effects. 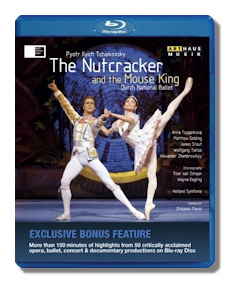 Interestingly, as in most movie releases on Blu-ray/DVD nowadays this ballet can be watched with commentaries by the choreographer and his assistant. An interesting alternative and quite instructive. Bonus features (19 min) include short interviews of dancers, Wheeldon, and a clip about the fabrication of the many wigs used in the production. Both productions considered here can compete with the best around. They beautifully demonstrate the talent and strength of the Dutch National Ballet dancers, and will offer hours of enjoyment for young and old.